Except just for once we didn’t. 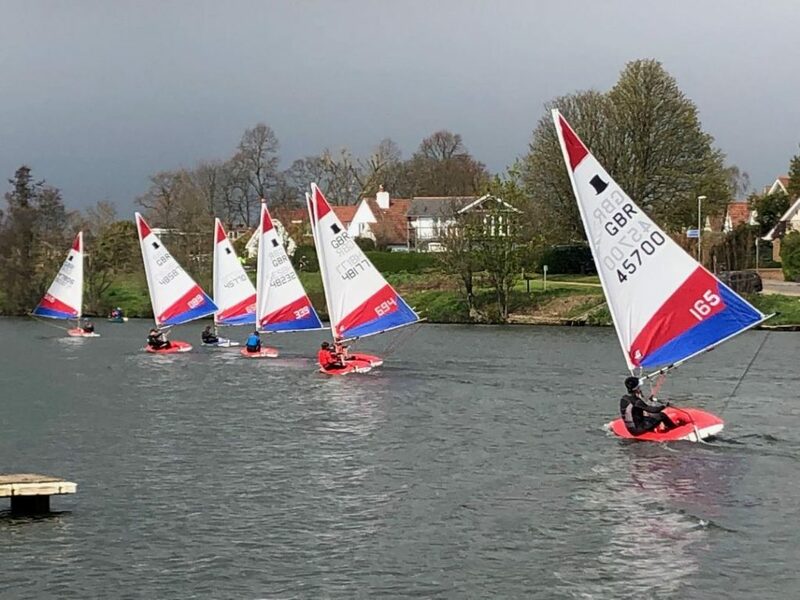 Instructors and students alike having struggled against on shore winds for the last four or five weeks took a break on Sunday. 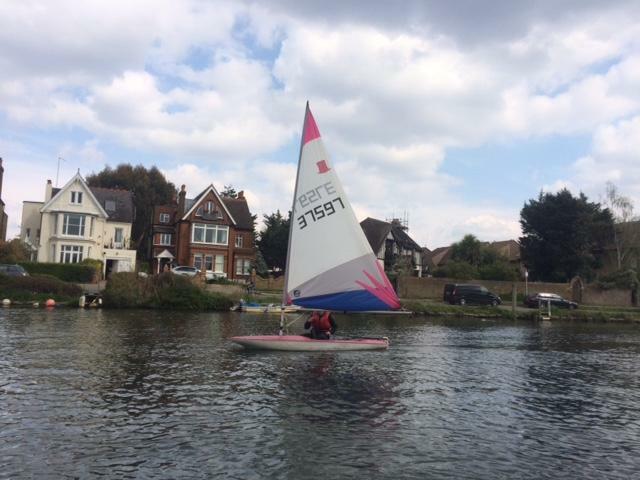 However Sandra and Phillip a couple of potential new members turned up for a taster sail so I took the chance of light winds to have a great sail in the Enterprise. Zoe, Peter and Sam having more or less completed their respective courses also took advantage of a nice breeze to have a “jolly “ in the afternoon. 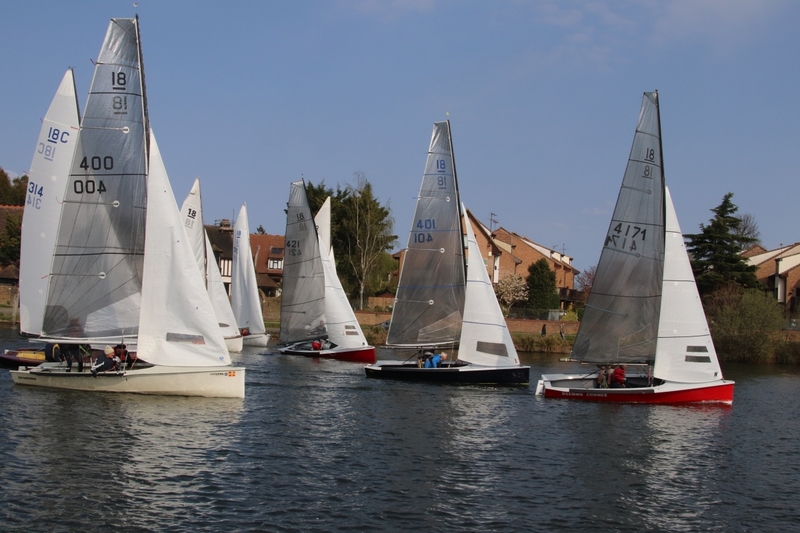 Easter Sunday brought glorious sunshine, a cheeky easterly breeze, and a good turnout of 15 boats competing in the annual Easter Pursuit Race. A number of different classes were represented and it was fantastic to see three Topper take to the start line. 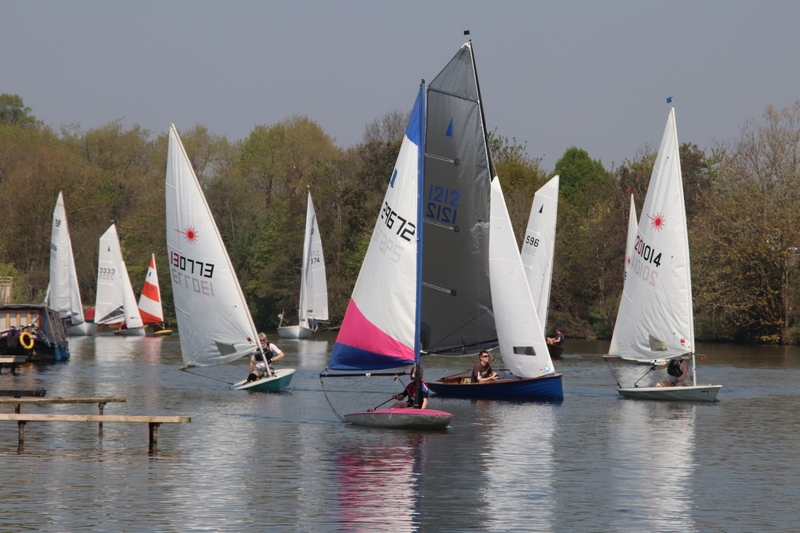 Well done to all of you for joining in and we look forward to seeing you developing your racing skills every Sunday by competing in the Topper class race that starts at 11.10. 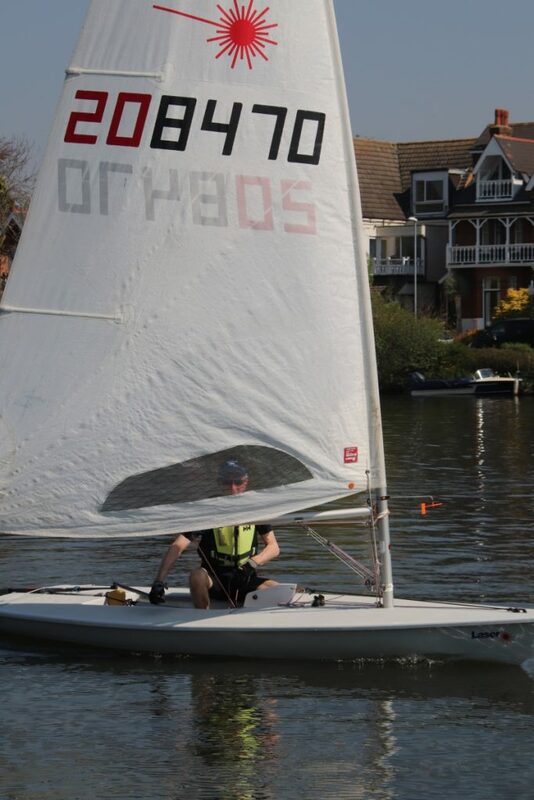 Stewart Colley in his Laser sliced through the fleet and was un-catchable winning in fine style. Ken Duffell and Joe Woods finished in second place well ahead of the other Merlins. 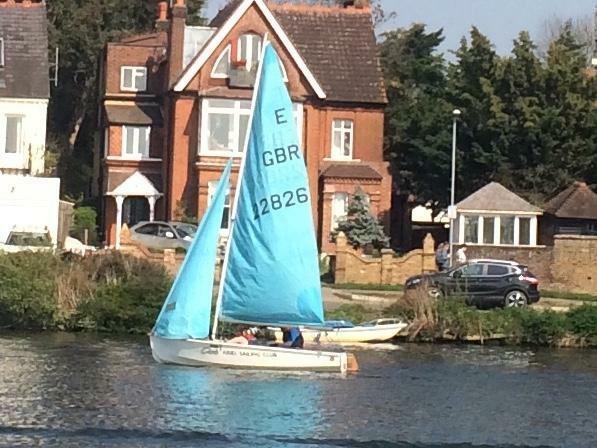 David Baker and Jim Green came third on their return to the water after a couple of months away. 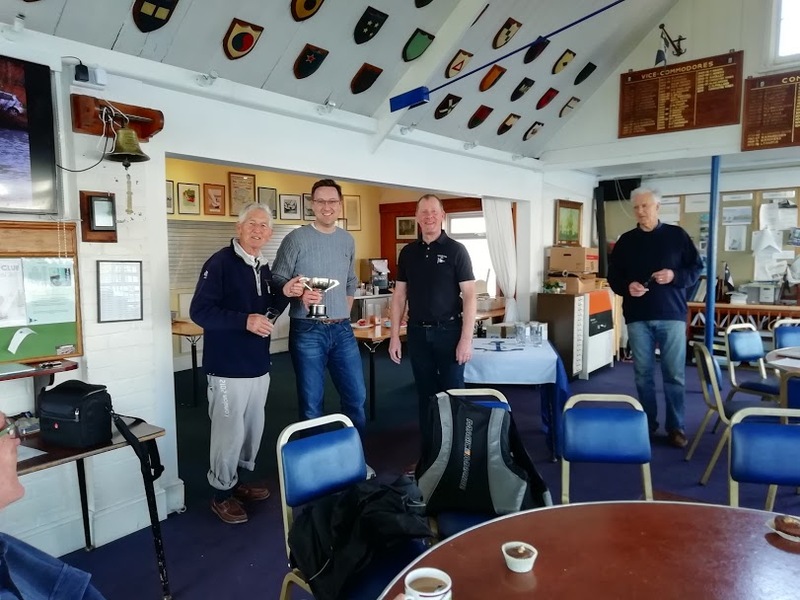 Tim and Ed Medcalf came fourth in their Merlin ‘Samanda’, just ahead of Barry Mourant and Jon Medcalf, also sailing a Merlin ‘Fair Cop’, who rounded out the top five. 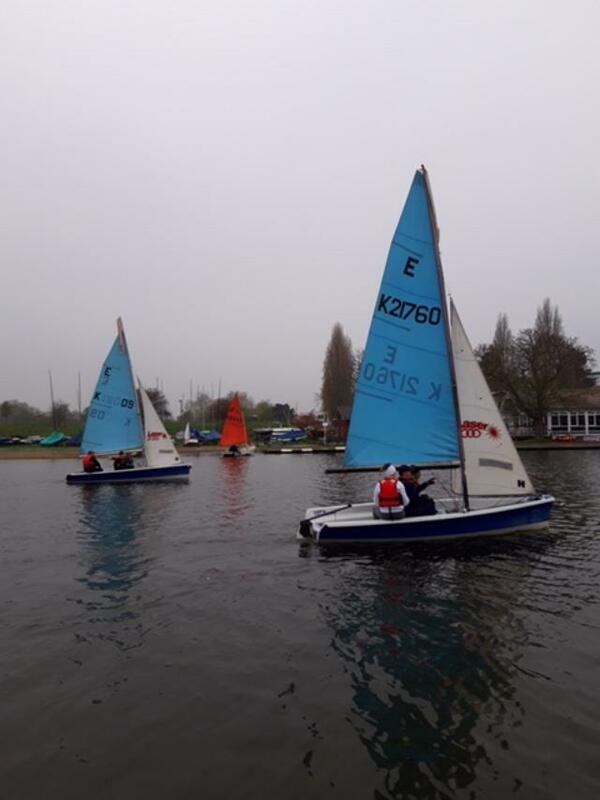 Chocolate Easter Eggs were awarded to the all boats, congratulations to everyone who took part and enjoyed the fun on the river. 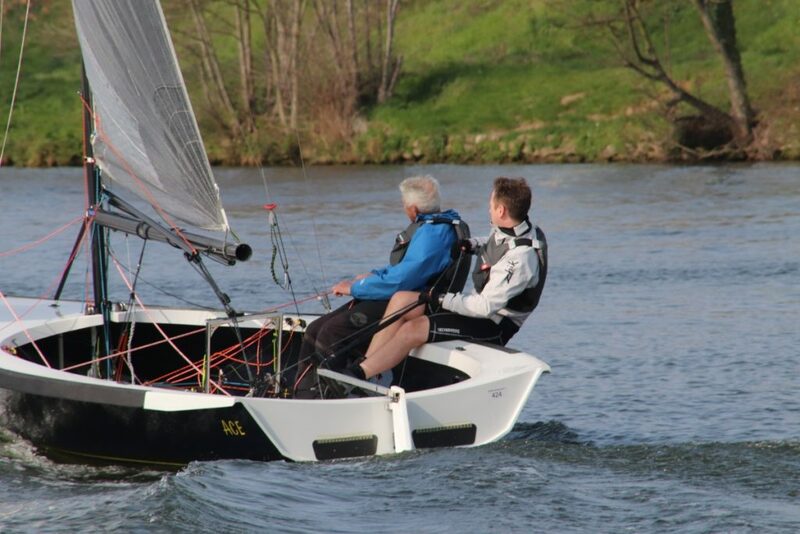 There will be several more handicap and pursuit events this year, in addition to the regular Sunday morning and Thursday evening handicap races, and they are a great way to get involved in racing for the first time – any class can enter, bring your own or borrow one of the club’s fleet. Keep reading Tammy Matters or looking at the calendar on the club website for more details. 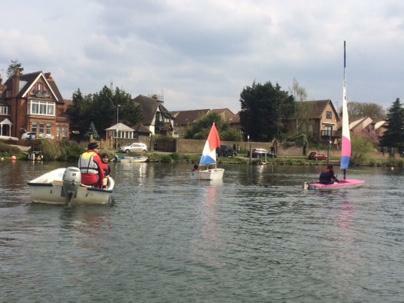 With Push the Boat out looming the training team concentrated on helping the students complete their current courses . This involved encouraging the adults to progress from 2ks to Toppers ! 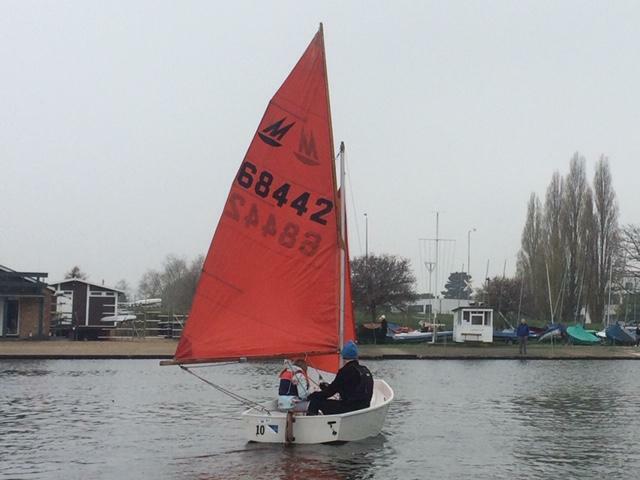 After some land drill and despite yet another onshore wind students had an “interesting “ first solo sail . Many past students have said this was the best part of the course . Others found getting back to the 2k almost relaxing . 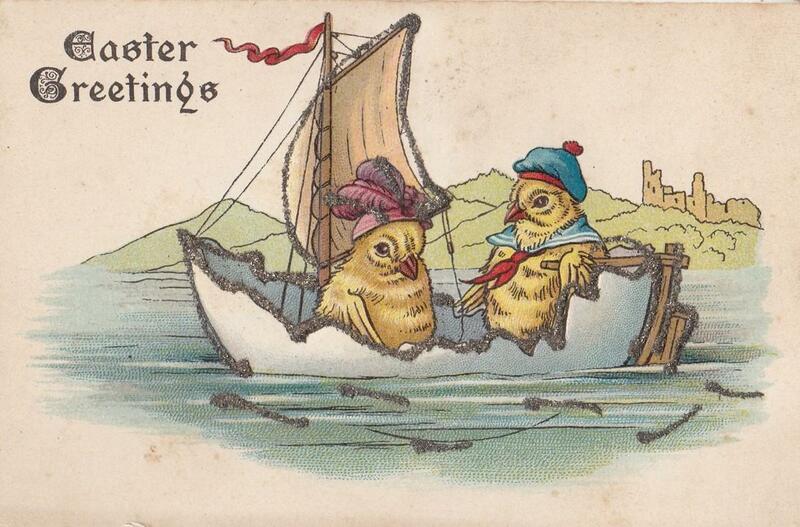 Sunday 21 April is Easter Day and also the Tamesis Club annual Easter Egg pursuit race. This race is always a lot of fun and the weather looks like it is going to be beautiful. There is no class racing but lunch will be served in the clubhouse as usual. 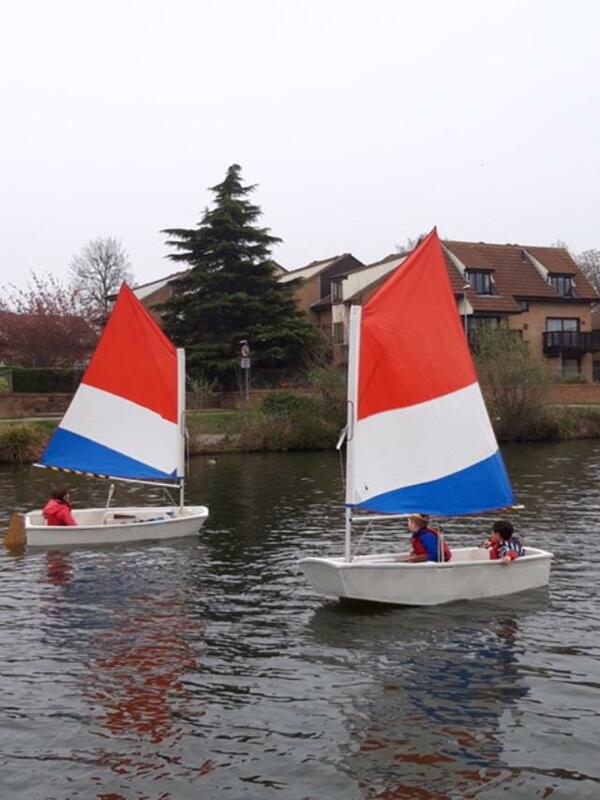 The Easter Egg race is a handicap pursuit, any boat can join in and club boats are available for crews who would like to borrow one. Slower boats start first with the theory being that everyone finishes together at the end of the race. 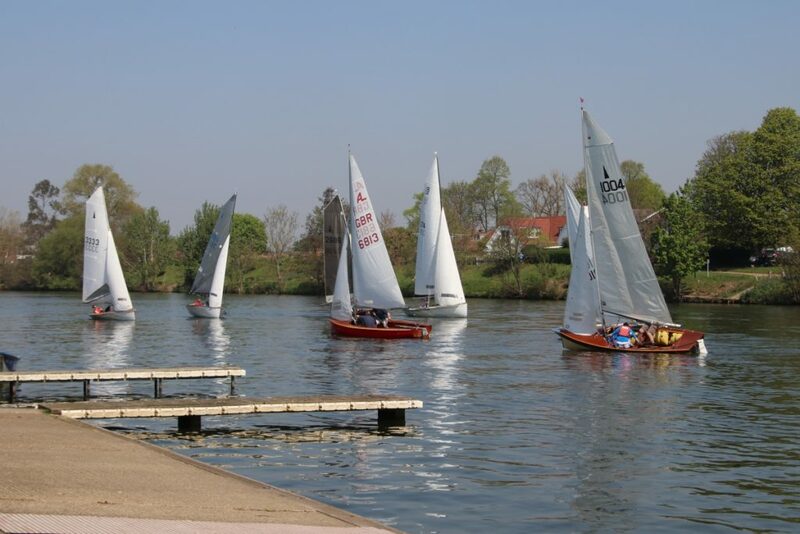 The first start will be at 11.00 so please be at the club in plenty of time so that you can rig and get on the water. 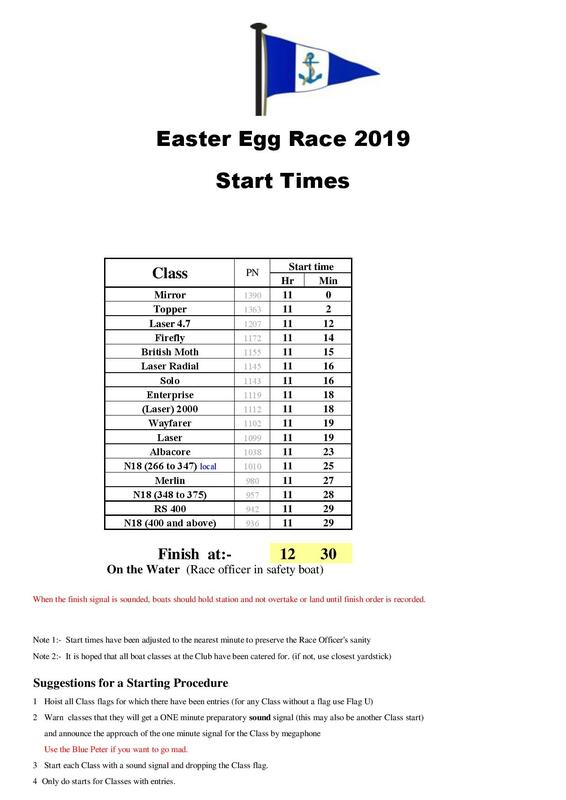 The race will finish at 12.30 and positions will be recorded by both the race box team and a group on the patrol boat; to make this process easier, once the finish gun has sounded please remember to hold your position on the course until it has been noted. There will be chocolaty prizes galore so there is a very good chance that you will go home with a tasty treat! 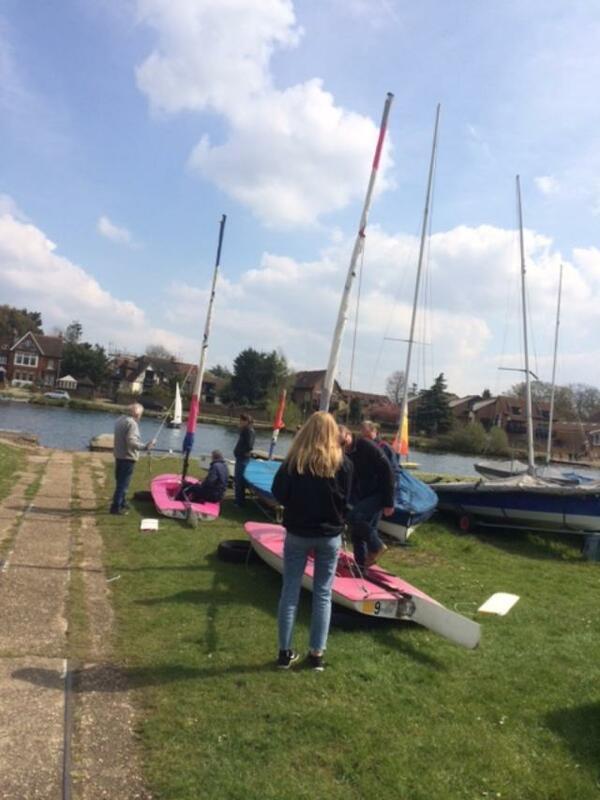 Saturday 13th was a very busy day at the club. 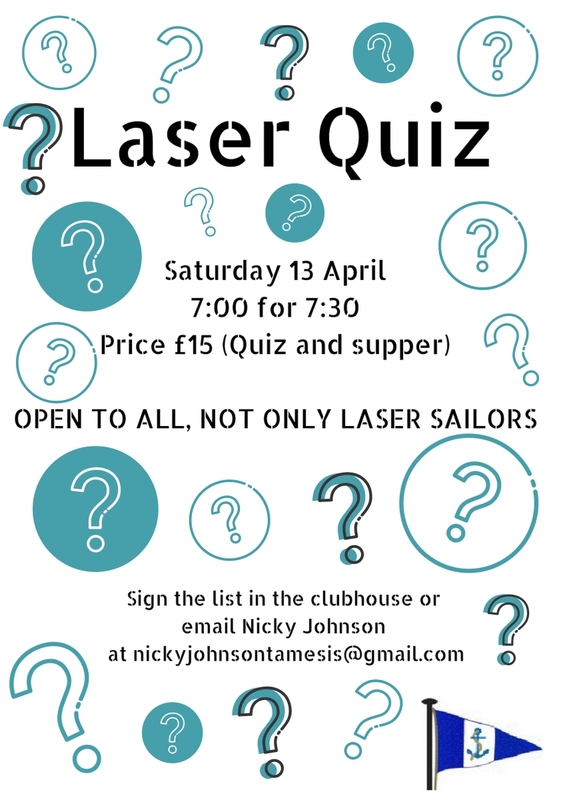 The evening event was a very successful ‘Laser’ Quiz Night where fifty five contestants were regaled with questions about local places through to how much we should pay for our River Licence (£41.10 – I just looked it up). A nine strong team of quiz organisers was led by Jim Green who master minded the whole evening. The team set the questions and answers, drummed up quizzers, set up the room beforehand, and performed as table match-makers, quizmasters, scrutineers and scorers for which we owe them a huge thank you. The winning team, ‘Canbury’, received bottles of wine as prizes. This team included Sally and Adrian Warwick-Haller, Duncan, Clive Mence, Adela, Stewart Colley, Chris Taggart, and Donald and Cherry Forbes. To the relief of others and resounding cheers, team ‘Shoestring’ was democratically chosen to be next year’s quizmasters! Many thanks also go to Sophie and her team of cooks and bar staff for keeping us fed and watered. 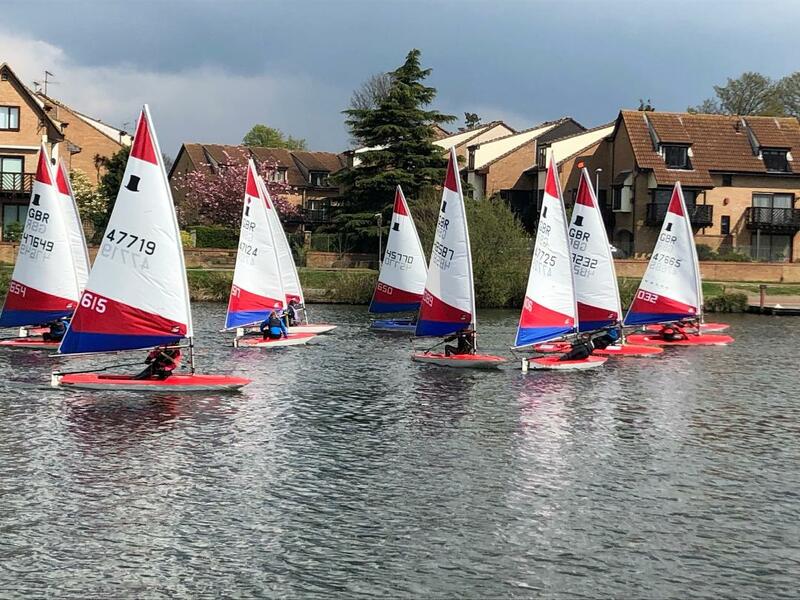 Fifteen Toppers turned out for the South East Travellers Open this year at Tamesis, competitors coming from several clubs. The racing was close throughout. 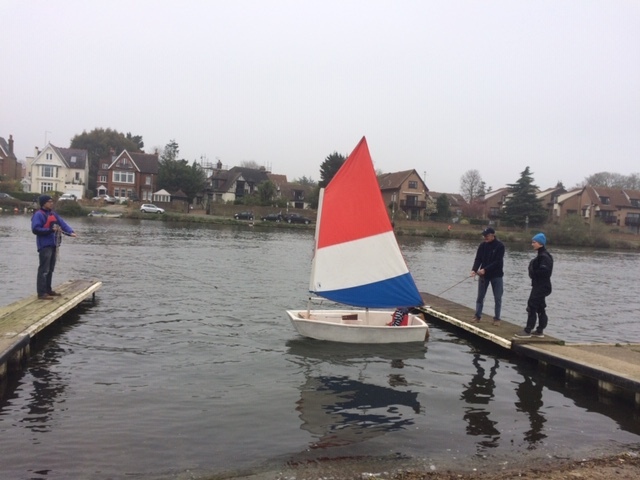 Race Officer Andrew Harris laid a course in front of the club which took advantage of the easterly wind that was present all day. James Crossley in 48232 and Bjorn Handley in 45770 dominated the day with a first and second each in the first two races, so the result was down to the wire. 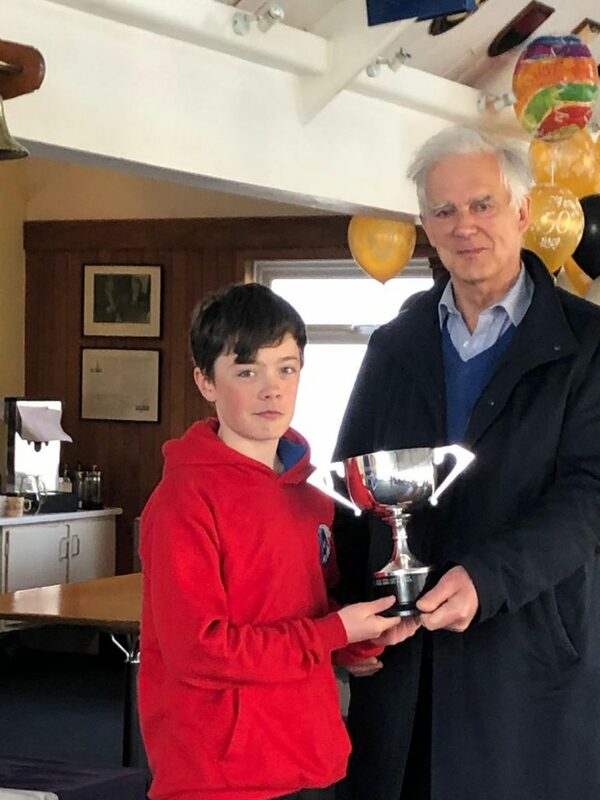 Bjorn won the last race but retired, so leaving James Crossley who was second in that race to take the Murray Vines Cup. Thanks to Andrew Harris as Race Officer, and his team Cherry Ehrlich, Daniel Gerber and Ian Ramage, and to Jo Carstens and her team for the catering. A milder north easterly let us get a lot done with six boats on the water. The shore based session concentrated on sail setting (half way between too far out and too far in ) using a tethered boat between the finger jetties . 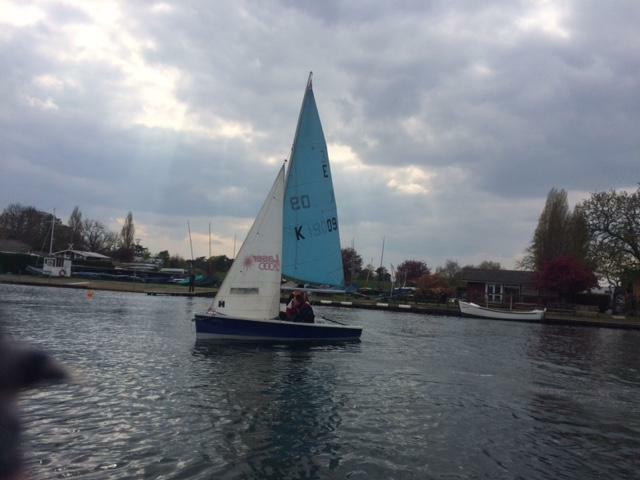 Students on the water were joined by Ellen in the mirror giving a new member a “taster “ sail. The Oppies seemed to have benefited from the earlier practise. And the 2000s had the benefit of onboard instruction. 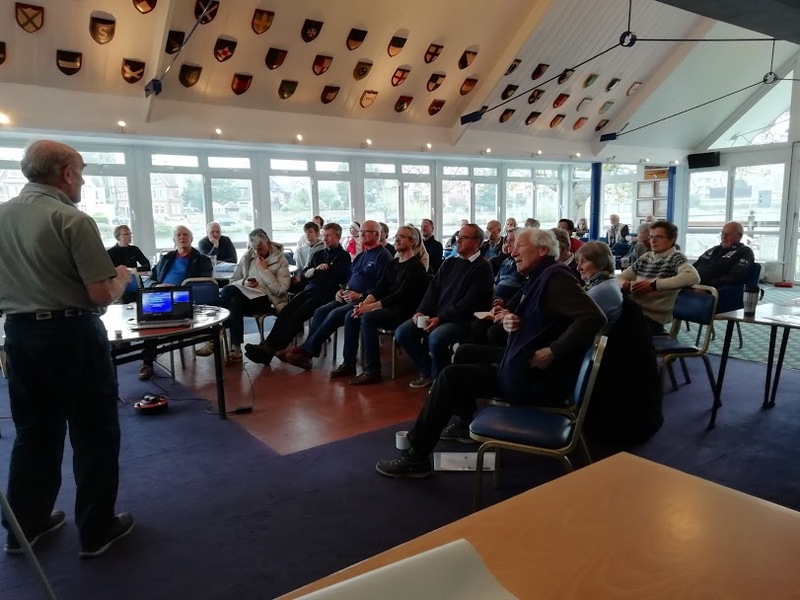 On Sunday afternoon, 35 members enjoyed a presentation from the RYA’s Chris Simon about the racing rules. The audience was made up of juniors, novice racers and seasoned regulars; everyone was able to take something from the talk and will feel that little bit more confident when they approach the start line of their next race. 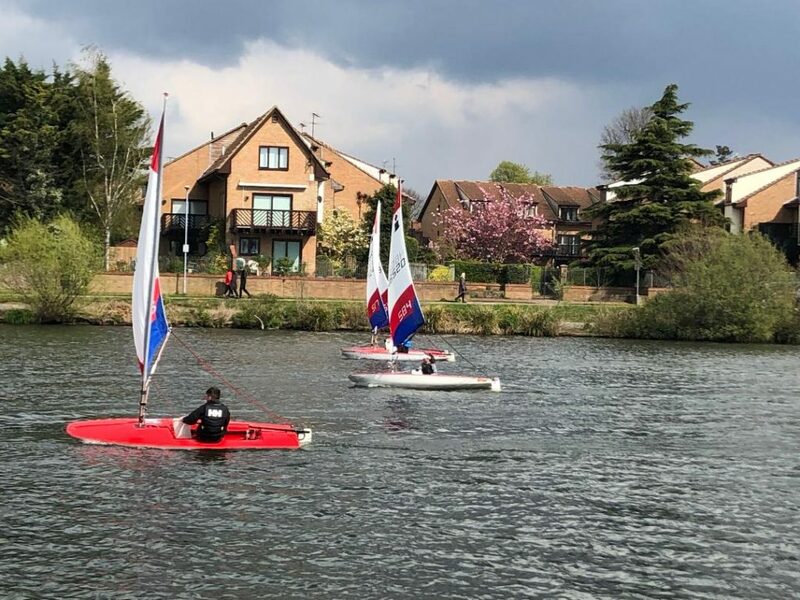 Special mention must go to our juniors some of whom had enjoyed the first race of the new Topper Summer Series fleet race in the morning. Great to see a new generation of Tamesis racers coming through’. 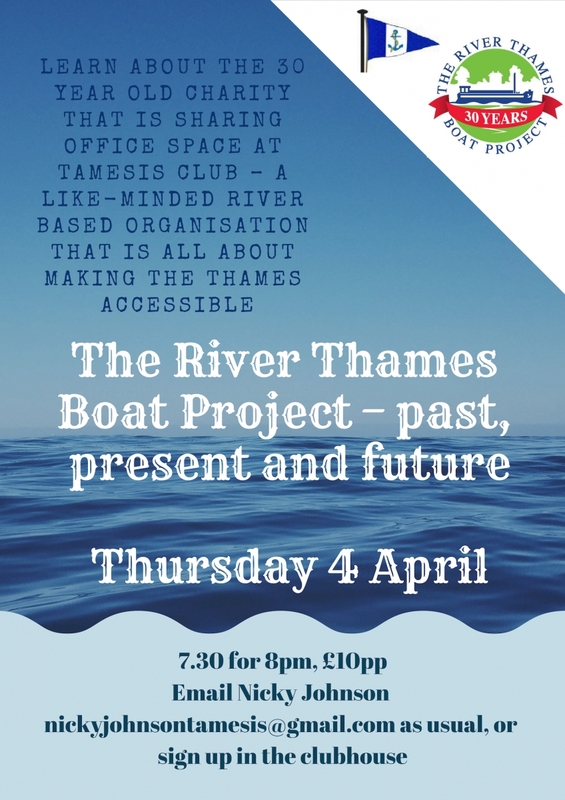 The staff of the River Thames Boat Project gave a fascinating talk to Tamesis members last Thursday evening. Peter (the Skipper) and Kate Dodds (Fundraiser) took us through the 30 year history of the charity. 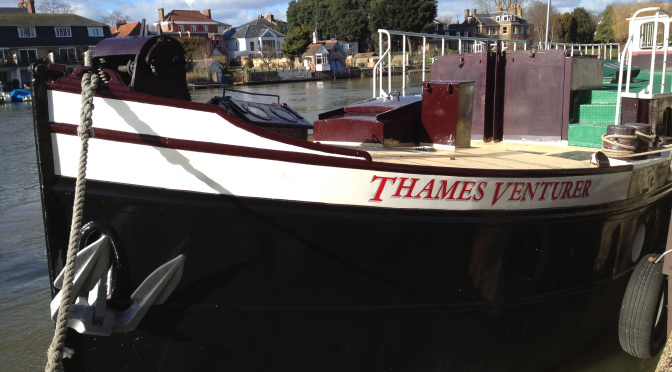 Thames Boat Project moved into the Tamesis office in early Februay, and have already started to be a valuable asset to the club. It is hoped to develop the cooperation between our organisations in the coming months. 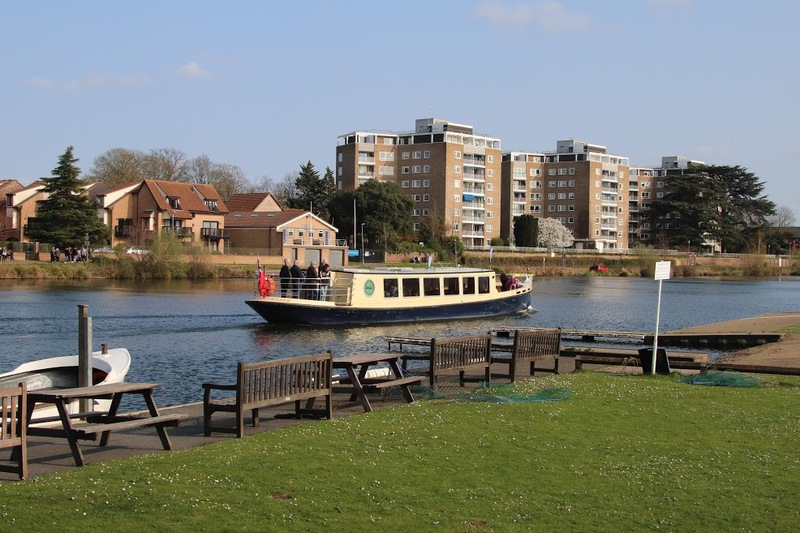 The charity started with a specially adapted barge now named Thames Venturer and have recently taken delivery of the purpose built Thames Disoverer as well. They arrange trips for many different groups, and have schools come for the day. See their website https://thamesboatproject.org for more info. Thanks to Sophie and team for a delicious supper and serving in the bar. The National 18 Spring Challenge brought out 8 boats, four of the new Ultras and the unique Woodstock, visiting from afar. 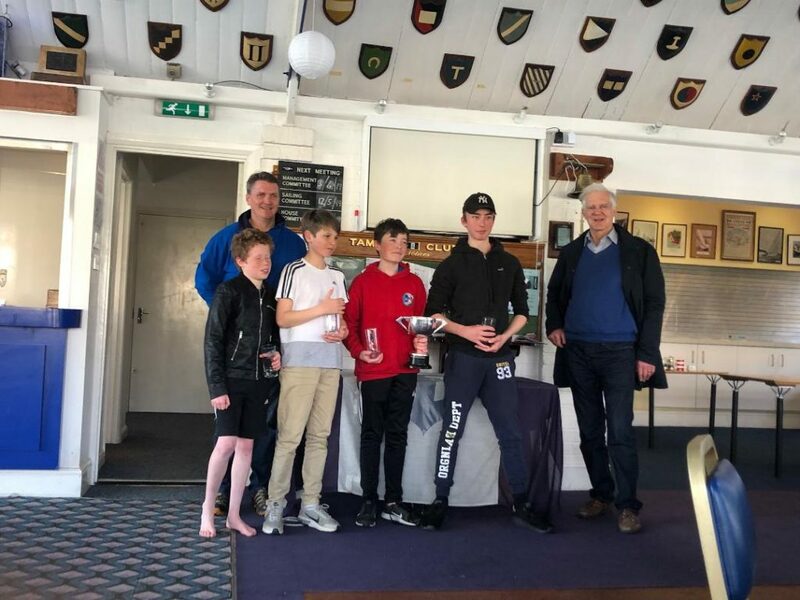 The 18s had two races in the afternoon in addition to the scheduled morning race and the Handicap series was won on the result of the last race by outport members Ollie Houseman and Jeremy Vines in their new Ultra, Ace, from Colin Murray’s visiting Woodstock. The first over the line was also won by Ollie and Jeremy. 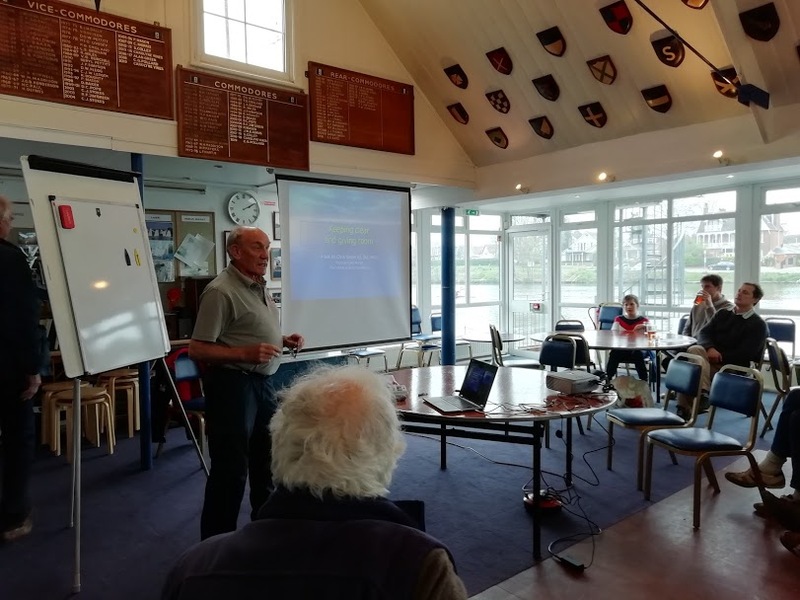 Many thanks to all to those who assisted in the organisation – Mervyn Alan, Martin Adams, Simon Thompson, Jenny Finlayson, David Jerram, Brian Timbrell, George Barber and Howard Thatcher, most of whom stepped in to help out. A very special thanks goes to Alan Green who invented the event.